About Martin Drive Neighborhood Association, Milwaukee - A healthly, safe, & fun place to live! The Martin Drive Neighborhood Association is a dues-free neighborhood association that runs on volunteers who contribute their talents. Events are free or have a small fee to cover expenses. Neighbors enjoy a complete democracy--everyone has a voice and is empowered to fulfill our mission. 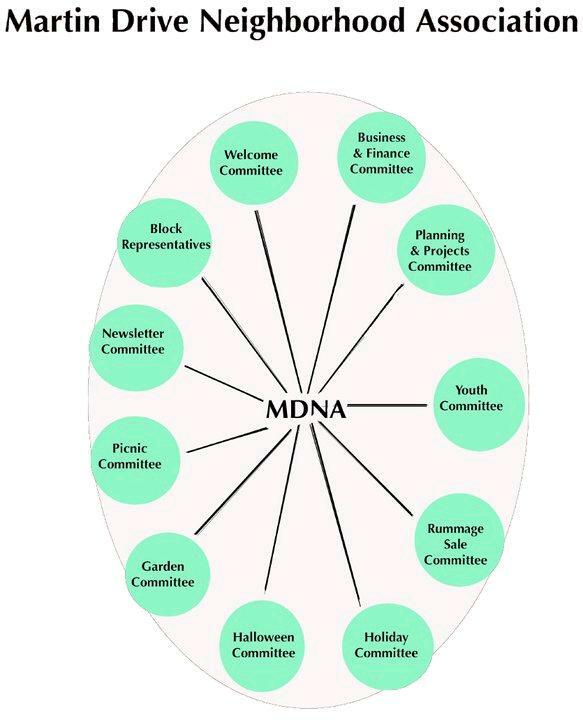 We are led by trusted servants, a new coordinating group that is entrusted by neighbors to follow the mission of the MDNA and serve in the best interests of all. Organizers help run committees. New projects and activities can be suggested and supported by neighbors. Neighbors and block volunteers attend meetings to express ideas and concerns, and to listen to other neighbors. They hear details about events around the city and neighborhood. From time to time, neighbors are asked to participate in special projects. Some of these activities are neighborhood cleanups, scheduling city services, newsletter publication (given out to every home in Martin Drive), night time trick and treating, planning neighborhood-wide meetings, meeting monthly with the third district Milwaukee Police Department Captain, connecting youth to nearby activities, neighborhood beautification & gardening, a neighborhood-wide rummage sale, evening summer outdoor movies, caroling and putting holiday red bows on trees in the neighborhood. Neighbors meet in smaller committees lead by an organizer and bring ideas to the monthly neighborhood meeting. The make-up of the organization implies that everyone will help manage the demands required of such a group of people. It is the voice of the neighbors that keep our police informed, our city government alert, our county supervisors aware of the needs of the Martin Drive neighborhood. We are in contact with our Alderman, Supervisor, and our state representatives because we are informed voters who know the workings of our government. Members can bring new ideas and present them to the neighborhood meeting. New ideas and positive comments keep the group motivated and enthusiastic about the improvements that have occurred in our neighborhood. Honestly, your involvement is really quite simple! 1. Come to a neighborhood meeting. 2. Keep up the outside appearance of your property. 3. Talk with your neighbors about your concerns. Recognize that loud music and horn honking disturbs neighbors. 4. Possibly volunteer to help with some event or help plan an event. 5. Watch out for your neighbors. Become aware of the normal neighborhood routine so that any unusual activities can be documented (calling the police, then email neighbors via martin-drive@yahoogroups.com) for further examination and action. 6. Learn about programs that can save you real dollars and can add value to your property. 7. Participate in one of the neighborhood events like the neighborhood clean-up, rummage sale, night time trick or treat, holiday party, summer movies, community garden, and the neighborhood summer picnic. 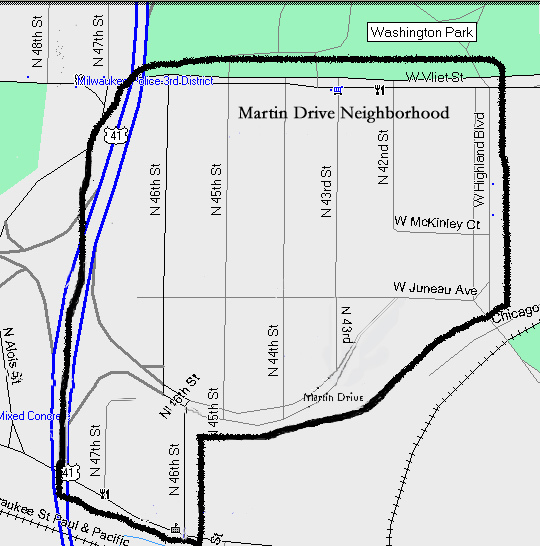 Martin Drive Neighborhood Association boundaries are Vliet Street to the north, Highland Blvd to the east, State Street to the south, and Highway 41. Here is a map. Neighbors bring ideas to the meetings, several times a year (except December) on a Saturday, 10:00 a.m. at the Washington Park Senior Center (map). What's the Martin Drive Neighborhood Association all about?